Could your laptop hold the key to beating jet lag? 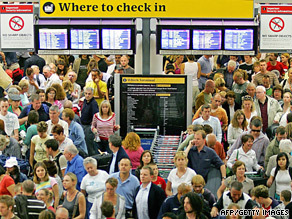 LONDON, England (CNN) -- Jet lag is the bane of the global traveler, but could your laptop hold the cure? Mathematicians in the U.S. are developing software they say could halve the number of days needed to adjust to a new time zone. Travelers would enter their flight details into the program to receive specific advice on when to sleep, to go outside for exposure to daylight, or to take mitigating supplements such as melatonin. The software is being developed by researchers at the University of Michigan and Brigham and Women's Hospital in Boston, who described their findings in the journal PLoS Computational Biology. "Timed light exposure is a well-known method for beating jet lag, but few people realize that if timed incorrectly it can actually make jet lag worse," Daniel Forger, professor of mathematical biology at the University of Michigan told CNN. Jet lag is a result of de-synchronization between the body's internal time clock and local environmental cues, leading people to feel active at night, and struggle to stay awake during the day. Researchers say the computer program will allow travelers to maximize their efforts to beat the problem, resulting in more efficient sleep, a decrease in fatigue, and an increase in cognitive performance. "In theory, a traveler could input what their schedule is, say here are specific times when I need to be at particular meetings, and use the computer to work out what counter-measures to use and when to use them," Forger told CNN. While the concept may prompt celebrations in boardrooms around the world, Forger has warned that it may be another five years before the product is ready for release. To build the mathematical model, researchers exposed people on varying sleep-wake schedules to different quantities of light to find which combination delivered the best improvement in performance. The study's lead-author Dennis Dean, a researcher in the Division of Sleep Medicine at BWH, said the program's applications went far further than business travelers who were trying to stay awake during meetings. "Although this method is not yet available to the public, it has direct implications for designing schedules for jet lag, shift-work, and extreme environments, such as in space, undersea or in polar regions," he said. The next phase of the research will look at how to integrate other jet lag beating methods such as caffeine, melatonin, or when to just take a nap.